The G7 leaders concluded their annual summit yesterday with a declaration that put climate change front and center. 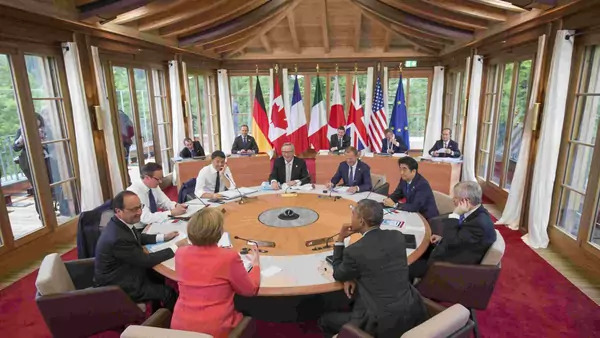 As with all G7 communiqués, most of the content reaffirms steps that the leaders have already promised to take and, in many cases, are already taking. But, as usual, there are some interesting wrinkles. I’m struck in particular the parts that seem to be the most important are different from those that have generated the most headlines. Here are a couple highlights in each category. The United States has long pressed for a shift away from binding emissions reduction commitments and toward a mix of nationally grounded emission-cutting efforts and binding international commitments to transparency and verification. European countries have often taken the other side, emphasizing the importance of binding targets (or at least policies) for cutting emissions. Now it looks like the big developed countries are on the same page as the United States. The language above is all about binding countries to transparency – and there isn’t anything elsewhere in the communiqué about binding them to actual emissions goals. This doesn’t guarantee a smooth landing in Paris – China, India, and others will resist some of the binding transparency and accountability measures that the G7 leaders want – but at least the big developed countries appear to be forming a fairly united front. This is the most substantive portion of the climate part of the communiqué. It reflects an increasing focus on adaptation in general and on insurance in particular. Existing institutions – notably the World Bank – are decently positioned to deliver on these goals (though meeting them by 2020 will be challenging). Indeed this part of the communiqué is unusually straightforward, and therefore well suited to clear follow-through. The mushiest bit is the undefined “climate change related hazards”. Ideally G7 countries would help vulnerable populations get access to insurance against extreme weather hazards of all origins – whether or not those are generated by climate change – and, in practice, that’s presumably what insurance would do. News reports have experts debating whether Paris can assure the world of cuts this deep. The answer should be obvious: it can’t. No decisions made today will assure any particular outcome in 2050 or 2100. For all practical purposes, the two-degree target that diplomats have talked about for the last five or so years has always been understood by policymakers to correspond to roughly a halving of global emissions by midcentury. If the-two degree target didn’t motivate deep enough emissions cuts to actually meet it, recasting it in terms of global emissions won’t change that. Having a basic guide is useful, but beyond that, the details are pretty unimportant. Bottom line: Fiddling with distant targets is a great way to generate headlines, but doesn’t do much to affect policy and emissions themselves; at best it’s marginally irrelevant, at worst it lets people feel good without doing anything. This superficially sounds big: the United States and others pledged in 2009 to mobilize massive amounts of money for developing countries; observers have been skeptical that they would deliver; but now G7 leaders are emphasizing their “strong commitment” to follow through. In practice, this is mostly an exercise in redefining the original pledge so that more private financial flows get counted toward the $100 billion. This isn’t necessarily bad as a matter of policy, but the political reality is that leaders from many developing countries want (and, at Copenhagen, thought they were getting) something else. It will be up to them in Paris to decide whether they’re ok with this redefinition of the goalposts. If they are, the conference is far more likely to be successful. But what will ultimately matter politically is not whether G7 leaders claim that they’re meeting their financial pledges; it’s whether developing country leaders are willing to go along.